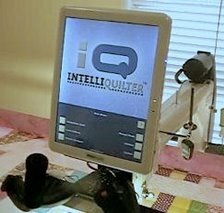 Quilt Advance Assistance is a step by step guide to realigning when advancing the quilt. It does not replace the existing realignment process, but is an added option. It will be particularly helpful to new users who may be confused by realigning, and when realigning patterns that have no obvious realignment point. QAA can be disabled if you prefer not to use it. Please read the release notes for this update more information. Having used QAA for a while when testing, I like it more and more. It lets me advance the quilt much further when doing pantos with a slight gap between the rows because I do not need to have any of the previous stitching visible after advancing. For patterns that are simply curvy with no obvious realignment point, such as the one I'm using in the video, QAA is invaluable. This video shows how a line pattern can be made using divide pattern. Divide pattern allows a closed pattern to be converted into an open pattern so it can be used as a line pattern or pantograph. This also shows the new remove button and scale reading. I show removing just one pattern from the pattern queue, ofcourse any number can be removed so if you've previewed several patterns, you can quickly remove any you don't want to use. Make sure they are on the screen and still red when you touch remove to take them out of the queue.